Chester have signed winger Peter Winn and defender John Disney, while Jamie Menagh, Craig Mahon and Craig Hobson have all agreed new contracts. Winger Winn, 25, joins after two seasons at Macclesfield, while 22-year-old Disney arrives from Hednesford. Striker Menagh, 20, scored four goals in 19 league appearances last term, while winger Mahon, 25, found the net three times in 27 league outings. 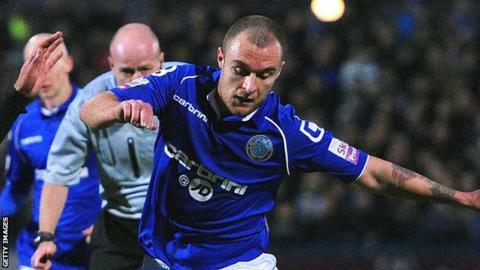 Striker Hobson, 26, joined the Blues from Guiseley in March. He played nine games last season, scoring twice. "Jamie Menagh and Craig Mahon are both young talents who excite the crowd when they play," said Chester manager Steve Burr. "Craig Hobson is big, strong and knows what is needed at this level." Winn added: "Steve has told me his vision and the type of football we will be playing next season and I'm as excited as anyone to pull on the blue and white shirt. "I played almost every game last season at Macclesfield and now it's time for a new challenge at Chester."